I have shelves of cooking books and most of them just gather dust. Why? Because their recipes are either far too complicated or just not interesting at all. Food is to be enjoyed and eating should be an enjoyment. Many of those writing cooking and recipe books forget this fact. Comfort & Spice does not fall into this trap. First impressions are often right and as I quickly thumbed through the pages for the first time I was constantly stopping to read and savour the different recipes. Plenty of ooohs and aaahs! This was not good as I had to select three recipes to publish as examples (see below) and I was just spoilt for choice. The three I have selected are good examples but there are so many more that are equally as good if not better . . . you do need to buy this one! The appearance of the 'New Voice in Food' books is strange because the covers appear to be low quality, presumably to save on publishing costs, yet the photography and quality of the pages is excellent. Perhaps it is just the design style. Whatever the reason never judge a book by its cover! Comfort & Spice is a book where the author shares her love for food and cooking but more importantly it gives encouragement to those who are hesitant about cooking or wanting to learn and gain experience. Definitely one for the kitchen shelf and would make a great gift for anyone you know that loves their food. 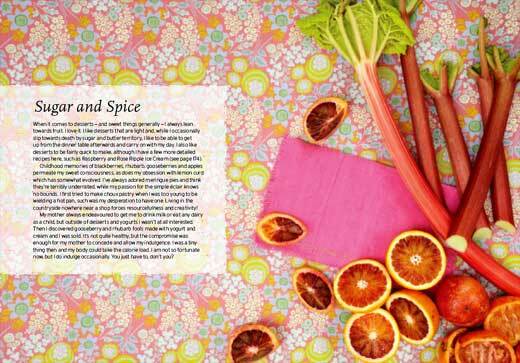 Full-flavoured, generous and easy to reproduce recipes have won Niamh Shields a huge following for her blog, Eat Like A Girl, as well as critical acclaim (The Times included the blog in its top ten food blogs from around the world). 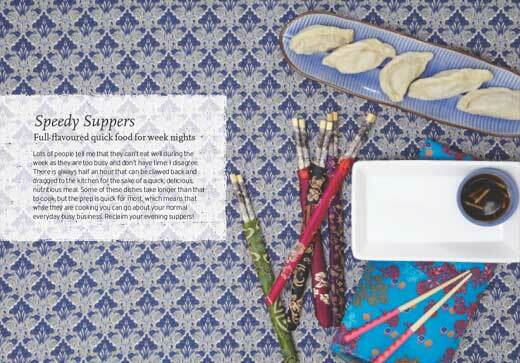 Now, for the first time, her adventurous though frugal food and warm, bright writing style is collected in a book. Niamhs gastronomic curiosity has gathered together the cookery of her native Ireland, in such dishes as the Cork speciality Spiced Christmas Beef, as well as exotically greedy but delicious Asian Chicken Skin Skewers, and an elegant Raspberry and Rose Tart, in dishes that embrace both the passing of the seasons, the foods of the world, and the special occasions of a modern life. Divided into chapters that reflect Niamhs enthusiasms  Brunch, Quick and Light, Share, Passions, and Weekend  the recipes also come with sumptuous ideas for what to do with leftovers. Always keen to produce spectacular meals on a budget, Niamh reveals how to treat just six or seven jars of spices as a palette to accent each dish you cook. 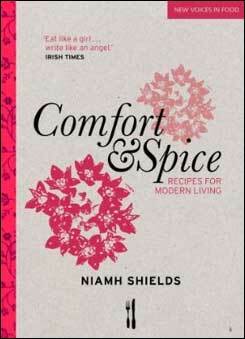 Comfort and Spice is a book both to read in bed and to splatter with sauce next to the stove, whether you are a nervous novice  a group of potential cooks very close to Niamhs heart  or simply someone who wants to make their food sing. With recipes from her native Ireland, but often with other influences and presented in her own way, this unassuming little cookbook offers some real gems. A self-taught and obviously passionate cook Niamh Shields aims to provide delicious tasting food that does not require deep pockets or an extensive larder of spices. The result is a collection of solid hearty dishes that will warm the coldest of winter nights along with some lighter dishes suitable for any time. Generous! That's what comes to mind when you first flick this book. Not only is it packed with loads of recipes but they all seem to offer so much. 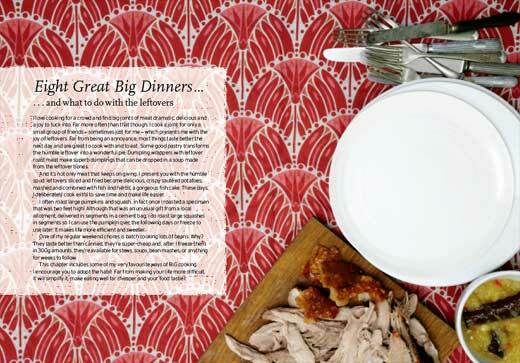 With dishes for all occassions ranging from quick and easy (Spiced Chickpea, Spinach and Feta Salad) to gentle and slow (Overnight Shoulder of Pork) Niamh's enthusiasm for comforting, generous food shines through. I am not a domestic goddess and I don't normally get excited over cookery books but this book is an exception. I'll be the first to admit that while I love food and eating, I am not generally a very good cook. Something about recipes seem to flummox me, and while I gain a great deal of pleasure from experimenting in the kitchen from time to time, the results are rarely as good as I might hope. This book, however, inspires me to have another go at the whole cooking malarky, because the author not only conveys the passion and intensity she feels about cooking and food in general, but she provides recipes that are SIMPLE and often very quick to make, even for a kitchen klutz like me! I love crispy squid, especially this version. I like it a little intense so use fiery, numbing Sichuan pepper, but feel free to use just black pepper if you dont want the same effect. 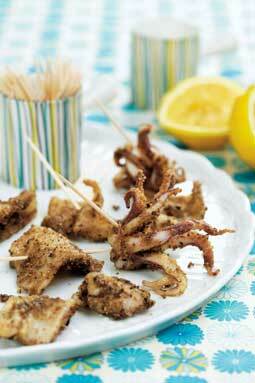 Squid is cheap, sustainable and easy to source. It also cooks super-quickly. Have your fishmonger prepare it for you if you dont think you can face it. Combine all the ingredients except the squid and oil and mix thoroughly. Place in a shallow bowl and toss through the squid. Heat 5cm oil in a very large pan, or a deep fat fryer, until it either reaches 180°C on an oil thermometer or a piece of bread froths the oil immediately when added. Fry the squid until starting to brown; no more than a couple of minutes. Cut lids from the pastry to fit each pie dish, using a dish as a guide. Butter each pie dish and divide the pie filling between each. Add the pastry lids, brush with the egg and cook for 20 minutes or so, or until delightfully crisp and brown. 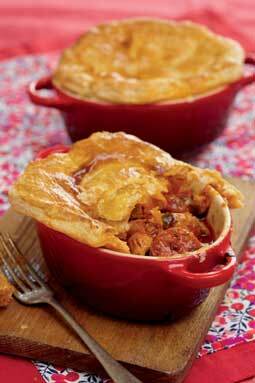 These pies are super, full-flavoured and bursting to get out from under the pastry. I use cooking chorizo and chicken thighs, as they have the best flavour and stay moist. I make these in 12 x 8.5cm cast-iron dishes..
Heat the butter and oil in a large sauté pan or saucepan over a medium heat, and sauté the chicken until it starts to brown. Remove the chicken and sauté the chorizo for a few minutes until it starts to release oil, then add the garlic and chilli for a minute or so, stirring to ensure it doesn’t burn. Add the tomatoes and paprika, return the chicken and bring to a boil. Reduce the heat to a low simmer for 10 minutes. Cut lids from the pastry to fit each pie dish, using a dish as a guide. Butter each pie dish and divide the pie filling between each. Add the pastry lids, brush with the egg and cook for 20 minutes or so, or until delightfully crisp and brown. Any roast bone marrow dish from me will have to give a nod to Fergus Henderson of St John, the only reason I ever tried it in the first place. 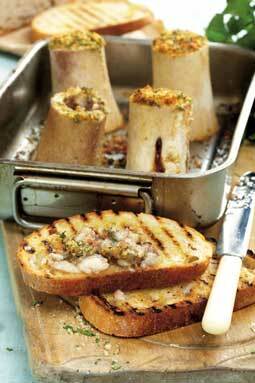 Roast bone marrow is a very rich and intensely savoury, umami-packed dish. It is beautiful simply roasted, scooped out of the bone and spread on toast. I also use it as a secret ingredient in beef-based sauces: finely chopped raw bone marrow gives my Gutsy Ragu an extra savoury depth and richness (see page 140). One bone per person is plenty and it makes a perfect lunch, or even an appetiser (though make sure your main course is lighter). It’s so dramatic looking that some of your friends may be taken aback; get them to try it and they will change their minds.. Combine the parsley, breadcrumbs and Parmesan and season with a little salt. Place the bones in a roasting tray with the largest bone marrow surface facing up. Cover the exposed bone marrow with the breadcrumb mixture. Roast for 15 – 20 minutes, until the marrow is starting to soften and is buttery in texture. Serve spread on good sourdough toast with some of that lovely crust mixed in.